If you write a lot of PL/SQL code, you must have thought of it at least once. It is probably when your teammate accidentally overwrote the same package that you saved seconds ago. Yes, I am talking about Team Coding. If you are using SQL Navigator or TOAD for Oracle, you are just couple of clicks away to refine your PL/SQL development experience. 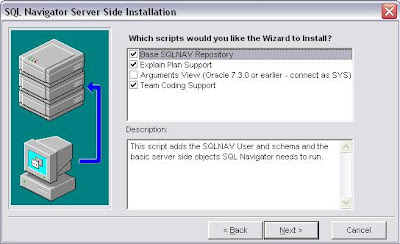 In this article, I will outline the steps to install Team Coding to your Oracle Database to use with SQL Navigator. If you are using TOAD for Oracle, then I recommend you reading this article instead. First things first, I haven't tried these installation steps on all possible versions of Oracle or SQL Navigator, but I believe they would work for most of them. In the office, we are using Oracle DB versions 10.2.0.1.0 and 10.2.0.4 and SQL Navigator version 5.1. This article describes how to create a heterogeneos connection between Oracle to SQLServer programmatically using Java. Please read the Article Creating Oracle to SQL Server Database Link to create this connection manually. Create a file of type .vbs (for Example odbcScript.vbs) with the code below. This script expects six input parameters that are represent by WScript.Arguments.Item(i) in the script. Below is the list of six parameters you need to supply. 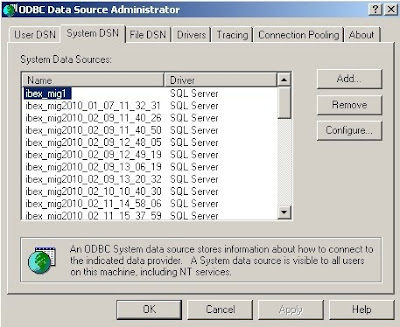 DataSourceName: The Name of the Datasource Connection (ODBC) you want create. Oracle Heterogeneous Services let you create a database link from Oracle to SQL Server. This method may be preferred over using a JDBC connection because it is significantly faster. Below is the list of steps you need to follow to establish a link from Oracle Database to an SQL Server so that you can query it from your Oracle Database. Select SQL Server from the driver list and click Finish. The Create a New Data Source to SQL Server Dialog will show up. Enter a name for the new Datasource (ibexLink in our example). Optionally enter a description for your Datasource. Select the server which you want to connect to from the list. The list displays all the computers in your network that have SQL Server installed. Changing the display style of an applet or a parent of the applet to any value other than "none" causes the applet to reinitialize in Firefox and Chrome. This change does not cause any problems in IE. Cross browser support was essential to us so I ended up changing the visibility or width&height attributes of the applet to hide it instead of setting its style.